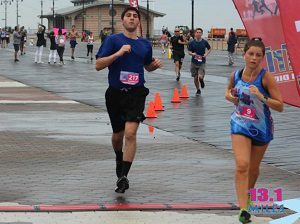 Earlier this month, Harrison Kashkin ran the inaugural Coney Island Half Marathon and generously raised money and awareness to help the parents and families the Partnership serves. Harrison ran in memory of his girlfriend’s sister, Danielle Rothstein, who passed away last winter at age 26. He became a Partner for Hope and set a $1,500 goal to help us bolster our customized, one-on-one tools and resources to help families like Danielle’s. With amazing support from his family, friends and coworkers, Harrison not only achieved his goal of $1,500, but he surpassed it, raising more than $8,500 for the Partnership. “It was an incredibly rewarding experience,” said Harrison of his effort. Fundraisers like Harrison’s allow us to further our work and expand our free, science-based resources for families in need of support and guidance when facing a loved one’s addiction. Memorial gifts made in Danielle’s memory will benefit the Partnership as well, and we sincerely thank the Rothstein family for their generosity. Learn more about how you can become a Partner for Hope and honor a loved one affected by substance use or donate to Harrison’s page.